What are the Best International Models for Measuring Quality of Governance and Why? 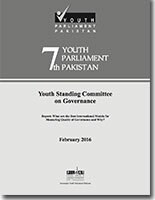 Youth Standing Committee of the 7th Youth Parliament Pakistan was tasked to develop cogent policy alternatives on “What are the best International models for measuring Quality of Governance and why?”. The Committee managed to develop a set concise policy recommendations in the shape of this Report after they presented and defended the Report to a Panel of Experts.